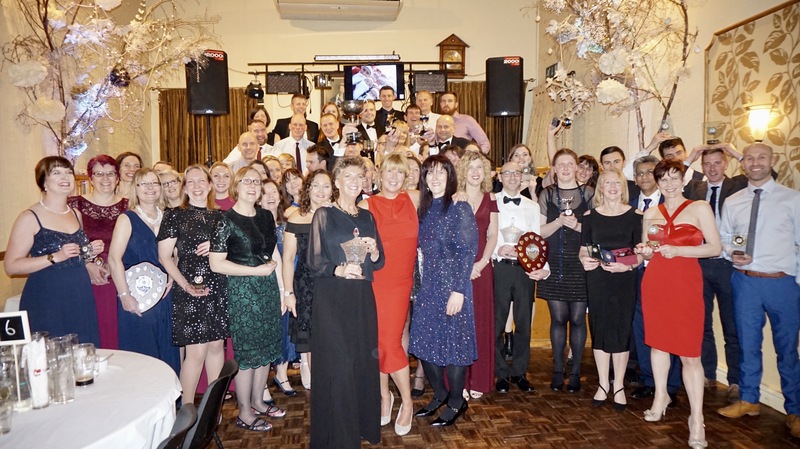 It was a big weekend for team Ivanhoe, as the Ashby running club gathered to celebrate it's many achievements of 2018 at the annual Celebration night. There were several standing ovations on the night, including for Maureen Danvers as she was voted Club Member of the Year by the members and Andy Jeyes for deservedly securing the Chairmans' Award after a fantastic season, including winning the first vet70 place in the New York marathon. An emotional presentation was made by the outgoing Chairman Heather Swan to best running buddy Laura Graves who persevered through multiple injuries to complete the Marathon Majors, the six biggest marathons in the world including London, Boston, Chicago, New York, Tokyo and Berlin. Laura won the ladies Brian Gough Award, while Ramzi Sidani won the men's Brian Gough award for his ultra marathon exploits including winning the inaugural Pen y Ghent 50k ultra. Another standing ovation greeted Martin Yeomans for the Club's Ironman award, recognising Martin's achievement as an Outlaw. Ian Kirk naturally picked up the Margaret Hibell Endeavour Award for his marathon achievements, with 91 marathons to his name, including the awesome Marathon Des Sables in 2018, as he heads for the big 100! The best newcomer awards went to Andrew Bottrill and Fiona Betts, both of whom had great seasons, while the most improved awards went to two runners clocking numerous personal bests across 2018 at several distances, Jayne Bradshaw and Andrew Stanley. The team player awards went to Mark Bradford and Sarah Malone, both very popular and consistent presences at league and other races. The Club's grand prix series was a tight affair, with two ladies tying for first place, Emily Wideman and Gemma Shaw, with Helen Finn a worthy runner-up. Matt Pleass was the men's winner with Andrew Stanley second. Three trophies were re-presented for Club races won during the year, Ramzi Sidani and Emily Wideman being the Ivanhoe 20 winners and James Hammond the Adrian Smith handicap winner. League success was recognised with numerous trophies awarded. For the Burton and District summer League, individual successes were Ramzi Sidani 3rd V40, Shaun Coulton 1st v50, Emily Wideman 1st V35, Lucy McDermott 2nd v35, Fiona Betts 1st v45, Victoria Smith 3rd v45 and Helen Finn 1st v55. 100% awards were made to Pav Mazur, Emily Wideman and Fiona Betts. The men were awarded the league runners-up trophies, the counting team members being Ramzi Sidani, Shaun Coulton, Nick Rowles, Matt Pleass, Ian Bolton, Richard Martin and Andrew Stanley. The women were also league runners-up with Fiona Betts, Emily Wideman, Lucy McDermott, Victoria Smith and Helen Finn being rewarded. The Derby Runner cross country league saw Teresa Talbott, Martin Yeomans, Sarah Malone and Alistair Burgwin pick up 100% awards, while Julie Henfrey was Ivanhoe's only member to pick up an LRRL 100% award, a great effort by Julie. The Club standards have proved to be a great success, now being based on the Leicestershire County Standards. Tungsten awards went to Helen Brandon and Marie Miller, with a Tungsten Distinction (for nine distances covered) to Jessica Southwart. Pewter awards went to Jordan Cope, Tim Moore, Jayne Bradshaw, Sonia Hoult and Janet Joyce. Copper awards were made to Richard Hope, Karl Smith, Lucy Allsop, Kim Harris, Jenny Hope, Sarah Malone, Gemma Shaw and Teresa Talbott, while Kevin Laz and Mandy Morris picked up Copper Distinctions. Bronze awards went to Pete Mouncer, Richard Bebbington, Andrew Bottrill, James Cox, Mukesh Deva, Patrick Horn, Matthew Joyce, Andrew Stanley, Sophie Cooper, Karen Hartland, Judy Mouncer, Emily Partridge, Victoria Smith, Julie Taylor and Andrea Trickett. Silver standard awards were achieved by Fiona Betts, Helen Finn, Lucy McDermott, Emily Wideman, Karl Wideman, Mark Bradford, Alistair Burgwin, Andy Lindley, Mark Parker and Matt Pleass. The very difficult Gold standard was achieved by Sue Tait, Matt Brocklehurst and Nick Rowles, while a loud cheer greeted the award of the Diamond standard to the machine that is Andy Jeyes. So, another great celebration night and fantastic start to 2019!